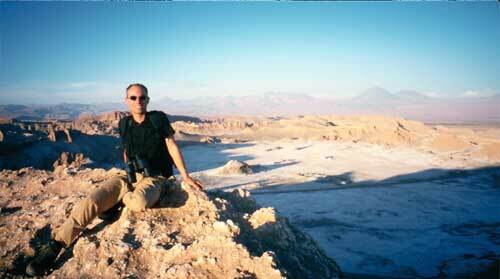 San Pedro de Atacama: Valle de la Luna by day. Watching the sunset from the great sand dune. Floating in saturated salt water of the Laguna Cejar. In the afternoon I once again visited Valle de la Luna. I had visited almost all of the places during the night but the daytime view was fantastic. And it was amazing what hills we had climbed during the night not seeing how dangerous it was. Finally we went up the big dune again to see the sunset. Being a fan of "The little Prince" I had to see sunsets in the dessert. It was an experience but not the one I had hoped for. 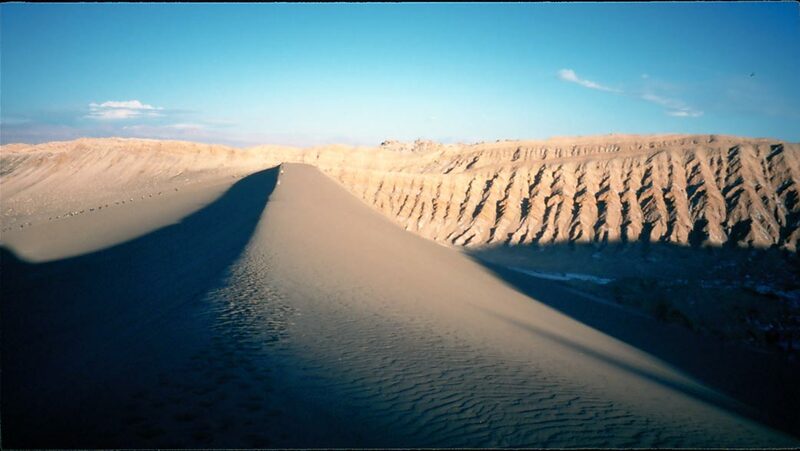 Imagine a giant dune, not a single hill but a long one in the middle of the dessert mountains. 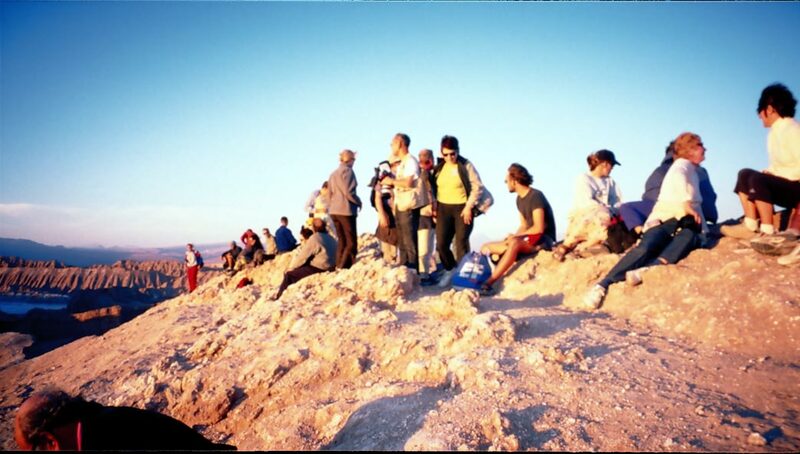 Here in the middle of nothing, a huge group of tourists (at least 50) climbed up the dune, went all the way over its ridge, climbed a small, rocky mountain ridge until it was totally covered by tourists. And here we waited for the sunset which was nothing special as in some distance of our ridge there were more mountains and the sun sank behind them without even turning red. So it was a strange and even absurd experience. The horizon had some nice colours but not what I had hoped for. This time I did not roll down the dune but ran barefooted as fast as I could which also was quite funny. The last thing I did in San Pedro was visiting the Laguna Cejar, one of the tours only few tourists do. The lagoon’s water is saturated with salt, it is absolutely clear and only some tiny crabs can live in it. The shores are covered in salt crystals sharp as glass. The two other tourist (yes! a group of only three!) cut their fingers quite deeply. 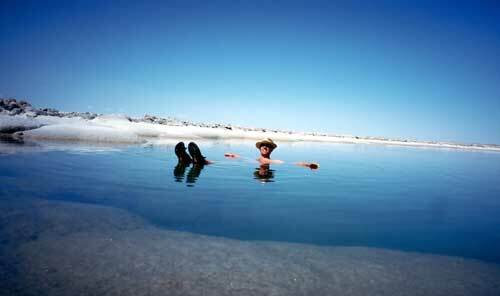 But the main reason to come here, of course, was not to see the lagoon but to swim or better float in it. Just lay back and do nothing like in the Death Sea . If you should want to turn over be careful as the water hurts quite a bit if it touches the face as it burns like hell if you get it in your eyes. First the water felt a little cool but then it was excellent. The water doesn’t sting or hurt your skin but after leaving the water you will be covered by a white layer and the salt becomes quite itchy as the next shower is an hour away. But that’s really worth it.